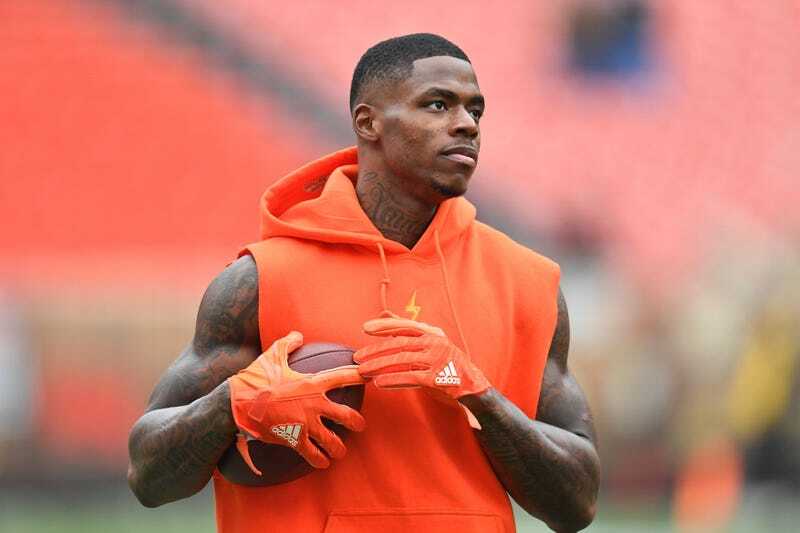 If the Browns’ announcement that they’re done with Josh Gordon came as a shock, well, things moved quickly. According to multiple (and not always concordant) reports, Gordon showed up to work on Saturday late, injured, and maybe a little messed up. Gordon also told the team that had a pulled hamstring, which was news to the Browns; he had been fine in practice the day before. ProFootballTalk reports that the WR told the team he had hurt himself at a promotional photoshoot. A handful of teams have already expressed interest in trading for Gordon, according to reports. NFL.com’s Ian Rapoport said last night that “as many of five” teams were doing their homework. While Gordon has no say in where he goes, ESPN’s Adam Schefter reports that he’d like to go to either the 49ers or Cowboys. Gordon nearly ended up in San Francisco in a 2014 trade, you may remember. There isn’t a team in the NFL that wouldn’t get better by putting Gordon on the field. The problem all along has been the distance between having him on the roster and having him on the field. But at a cost barely more than the league minimum, and with two seasons of team control remaining, Gordon’s risk/reward calculus is clearly in favor of him getting another chance. We should find out by tomorrow which team’s the most eager to give it to him.